Why Aren’t They Grounding Flights in Birmingham? It was all over the news a couple of days ago that human caused climate change is so severe that Sky Harbor airport in Phoenix, Arizona is having to ground planes. Most of the “greenhouse gases” are in Alabama. Why aren’t they grounding flights in Birmingham? Birmingham is a city in Alabama at the nearly same latitude as Phoenix in Arizona. Birmingham has a much higher concentration of greenhouse gases than does Phoenix. The mechanism by which human activity supposedly caused this June’s extreme heat in Phoenix, Arizona is the “greenhouse effect” hypothesis, which asserts that the atmospheric concentration of “greenhouse gases” and surface level air temperatures are directly proportional. That is, as the “greenhouse gas” concentration goes up so does the temperature because these “greenhouse gases” are said to “trap heat” in the atmosphere[i]. 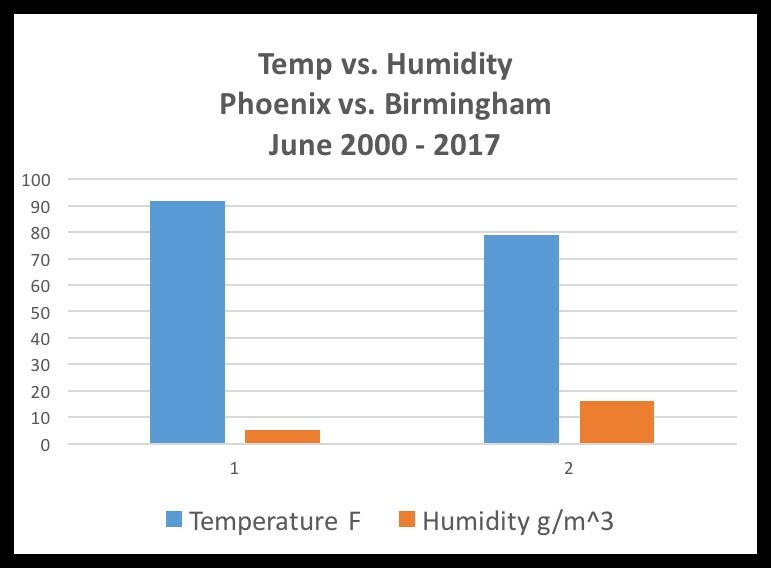 While the “most potent greenhouse gas” – water vapor – was 300% higher in Birmingham compared to Phoenix, the average June temperature in Birmingham was 13 °F cooler than Phoenix. This means that atmospheric “greenhouse gas” concentrations and ground level air temperatures are inversely not directly proportional. Water vapor has a distinct, obvious and measurable cooling effect on ground level air temperatures. The hypothesis that asserts that atmospheric “greenhouse gas” concentrations and ground level air temperatures are directly proportional is therefore falsified by empirical observation. This, of course, does not mean that people will abandon their belief in the “greenhouse effect” hypothesis and stop making specious claims like the high concentration of water vapor in Alabama causes heat waves in Arizona, but at least now you know that they are simply “blowing smoke”. Gallery | This entry was posted in Fraud of the Greenhouse Effect and tagged Brehmer, flights, humidity. Bookmark the permalink. 12 Responses to Why Aren’t They Grounding Flights in Birmingham? Haven’t checked, but I suspect that Phoenix is at a much higher elevation above mean sea level than Birmingham. If so, the air there will be less dense. The concern will be safe climb-out on takeoff if an engine fails. About 440 ft difference only. Seeing 485ft now. All aircraft types have published maximum Outside Air Temperature for operation. Engine-out performance will be part of this. Component overheating will also be a factor in deciding the limit. With forecast maxima of 120F on the day, this exceeded the operating limit of some smaller aircraft, eg Bombardier CRJ (118F). Still not seeing a ‘GHG’ link. No aircraft operating authority that carries fare paying passengers is going to operate outside its cleared flight envelope. The rest is flute music. I would note that the airplane news was only the spark that started the essay. The essay itself is about the differences in temperature vs. “green house gasses” of the two cities. The author points out that the city with much more “green house gas” should be much hotter than the other city. And, according to “consensus” theory, it should be hotter. This is just another problem for the rGHE theory — one out of at least a thousand I bet. But to me, the biggest problem with rGHE is that the cold upper atmosphere can not warm the much hotter ground via “back radiation”. Anyone who believes that needs to take a thermodynamics class or two. markstoval: That is what Carl is trying to say — that Birmingham should be hotter than Phoenix but isn’t — but it’s not just insolation and radiative gas concentration that determines temperature when comparing or contrasting two cities. There are may other factors. Phoenix is surrounded by desert, and the winds are from the east… over desert. Birmingham is at about the same latitude (insolation) and altitude (pressure and distance to TOA), but the area is forested in all directions, and the winds are from the north… across more forest. It’s not a valid demonstration of radiative forcing, for or against. The cities’ environments are too different. You have to fight the warmists with valid comparisons, not ones stacked by other environmental differences. What you are saying Tom is that other natural forces completely obliterate the “greenhouse effect”, i.e., what should have been the warming effect of the 300% higher absolute humidity in Birmingham was turned into cooling. Exactly, how can it then be claimed that the “greenhouse effect” is what controls surface level air temperature? When I have in the past demonstrated with temperature and humidity data that humid regions are predictably cooler than arid regions that are at the same altitude and lie along the same latitude, similar responses to yours were evoked–there are other forces at play that cause the cooling and it is not the water vapor itself that is causing the cooling. This ignores several thermodynamic processes. The surface is cooled in the creation of the water vapor though evaporation; the surface level air is then cooled by the presence of water vapor because water vapor increases the emissivity of air, which enhances the intra-atmospheric up-going net-radiation heat loss rate. It is a universally accepted reality that thermal energy moves up the atmospheric column more efficiently when the air is humid, which manifests itself as a markedly decreased lapse rate. (Weather balloon soundings taken June 21, 2017 in both Phoenix and near Birmingham showed that the lapse rate below 5 km in altitude was 1.5 C lower in Alabama, while the temperatures and lapse rates above 5 km were nearly identical above both cities.) The surface is also cooled when the water vapor condenses into clouds and shades the ground; the surface is further cooled when cold rain falls to the ground and the cool rain absorbs thermal energy from the ground via conduction. Certainly a cool wind from the north would add to the cooling effect of the water vapor, but even without a north wind the added humidity would still decrease the lapse rate below 5 km. Since the temperature of the upper troposphere above Birmingham was nearly identical with that above Phoenix on the day in question, it is simply impossible for water vapor to result in warmer ground level temperatures. In other words, in order for the “greenhouse effect” to be real, water vapor would have to increase rather than decrease the lapse rate below 5 km. (Above 5 km the air has very little water vapor because it is too cold.) The lapse rate below 5 km over Phoenix on June 21, 2017 was 7.5 C/km and the lapse rate below 5 km over Birmingham on the same day was 6 C/km. In order for the humidity in Alabama to have caused higher ground level air temperatures than in Phoenix that humidity would have to have increased the lapse rate above the lapse rate in Phoenix, i.e., below 5 km the lapse rate in Birmingham would have to have been higher than 7.5 C/km. Hundreds of times per day weather balloon soundings disprove the “greenhouse effect” hypothesis because they universally demonstrate over and over and over and over again that water vapor decreases–not increases–the lapse rate and this manifests itself as lower ground-level air temperatures in humid climates. What I am waiting for is for someone to give me counter examples (demonstrated with temperature and humidity data) that show if an arid region that lies along the same latitude and is at the same altitude as a humid region is ever cooler its humid counterpart. All of the efforts that I have made repeating this research have yielded the same results; the more humid region is cooler than the more arid region. The criteria that I used to do this comparison was to choose two locations that are nearly similar in latitude (same amount of sunshine each day year around) and similar in altitude (Birmingham is slightly lower in altitude than Phoenix) but significantly different in humidity levels. There’s only 475 feet elevation between them. What kind of differences would you figure exist? Just in general, there aren’t any differences to make his comparison invalid that I can see. The reason I ask that in such an offhand way, is that the article is a very well known and often pointed out reality. If there’s water in the air on the ground, the temperature is always going to be cooler, because of very well known principles. identically to the way moist air from an evaporative cooler washes energy off the objects within a structure. I lived in Tucson Arizona. I had relatives in Tuscaloosa, Alabama, with family friends in Birmingham. that would significantly impact the author’s article. when there’s so much room above, to rise. In other words and perhaps stated contextually differently, I can’t imagine ever having heard of a single instance in my life when sunlight was able to deliver the kind of energy to moist air, that could raise it’s temperature that high, and I don’t think I’ve heard of it. I could be wrong I guess. I’m pretty sure the world’s hottest places are all dry. If local CO2 concentration is a major consideration, why doesn’t everyone have a very hot upper lip?